Welcome to this week’s installment of Tried It Out Tuesday. This week I will be discussing a fun dessert that I created using Pamela’s Products Gluten Free Sugar Cookie Mix. 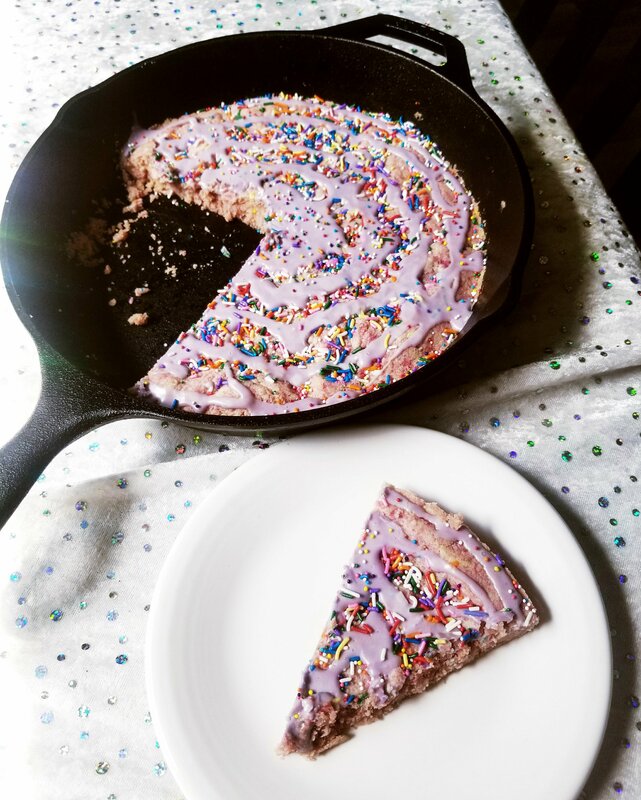 I created a giant sugar cookie using a cast iron pan and it is naturally colored and tastes just like cotton candy! This was my first time trying out Pamela’s Products Gluten Free Sugar Cookie Mix and if you have been following along you might have noticed that I am a big big fan of her other mixes. I love the ease of use and I also love the ways you can get creative with them and customize your recipe. Just use your imagination and the sky is the limit! For this tasty adventure, I used my 10.25″ Lodge Cast Iron Pan. I think of cast iron pans as an essential tool in the kitchen and if you ever want to make yourself a giant skillet cookie, cast iron is the way to go! I preheated my oven to 350-degrees and sprayed my skillet with coconut oil. The back of the bag for the sugar cookies suggested using butter but I swapped that for coconut oil, thinking that was a healthier way to go. To start up this recipe I placed the coconut oil and one egg in my KitchenAid stand mixer. I whipped it up for a bit and also added a generous splash or Lorann’s Cotton Candy Flavoring Oil. It suggests using this oil to flavor hard candy but I have had much success using it as a baking element. I then slowly added in the dry mix. Once the mix was about ready to go I gave it a squirt of red natural food colorings from Simple Truth (Kroger). The red color comes from beetroot. After the color was mixed in I took my ball of cookie dough and spread it out evenly into the cast iron pan. I made sure it was spread evenly and that it went all of the way to the edges. Then guess what? It was SPRINKLE TIME! I busted out my nonpareils and my bottle of Mr. Sprinkles and gave the cookie a heavenly shower of sweet sprinkle goodness! I often wonder how many people get turned off by my usage of candy sprinkles (insert a nervous LOL here). I happen to love them and I feel that a little extra sugar isn’t going to kill me. You only have one life to live (YOLO) so if you want the sprinkles, don’t hold back! Give whatever it is a good dousing of them. I enjoy eating clean as much as possible but I’m not going to restrict myself constantly and tell myself I can not have this and I can not have that. I am not a militant clean eater by no means. Just wanted to clarify that. I think of myself as a free eater that has a lean towards health and wellness. Balance, people! Back to the process! I was not sure how long to bake this so I kept checking on it. I started off at 10 minutes and that was not enough. I checked again a couple minutes later, nope! I am going to say it probably took about 15 minutes for this to be completely baked. I allowed the cookie to cool and then got to making some royal icing for it. I beat one egg white with my whisk attachment and added a little more cotton candy flavor to it… a very tiny bit! Once the egg got frothy from whisking I slowly added one cup of organic powdered sugar to it. I loaded up my Wilton Dessert Decorator with the icing and the smallest tip. This is a neat baking tool to have on-hand if you do not have piping bags. Just load it up and squirt! Also, if you have been reading my previous posts or following me on social media I have been using the Lorann’s Cotton Candy Flavor Oil frequently. If you are a lover of cotton candy and enjoy baking I would like to say that you truly need that oil in your life. The flavor that it gives your baked goods is phenomenal! I wish you could all eat a piece of this giant skillet sugar cookie that I created. It had a wonderful texture throughout it and the taste was spot on. When my husband approves of my gluten-free baking then I know it was a smashing success. Have you ever created a giant cast iron skillet cookie? What did you create? Leave me a comment and let me know. I would love to hear all about it. This entry was posted in Product Reviews, Tried It Out Tuesday and tagged beetroot, candy sprinkles, cast iron, cookie, cotton candy, dessert, gluten free, natural color, pamelas, pamelas products, royal icing, skillet, sprinkles, sweet tooth. Bookmark the permalink. Whoa! That looks Amazing! Just figured out I’m gluten and dairy sensitive. Thanks! These were delish and got gobbled up quick!